The Best Tool for the Job. There are plenty of hard workers in the ATV world, and Honda’s lineup stands at the top. But there’s one ATV that shines a little brighter, works a little longer, and tackles the toughest jobs or adventures day in and day out. And that’s the Honda FourTrax Foreman. The Foreman has long been Honda’s real workhorse, and plenty of riders find it the perfect size for both work and fun. It’s strong, rugged, famously reliable. 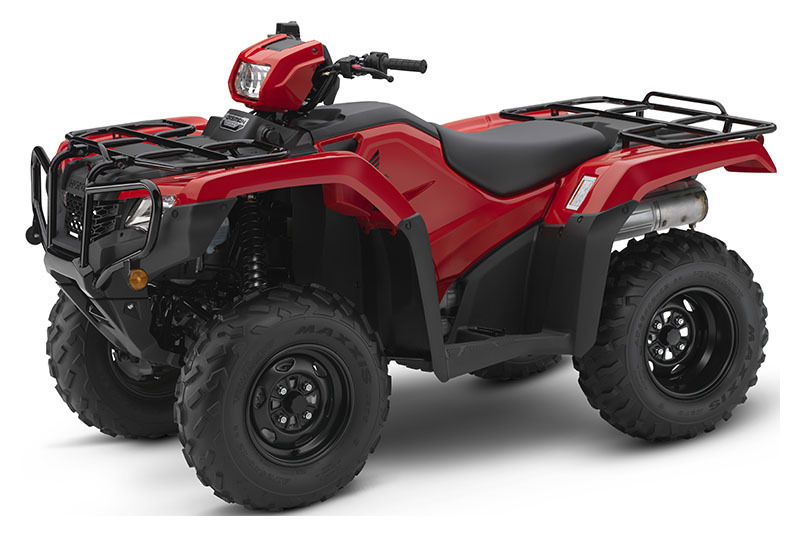 Plus, its superior Honda engineering means you get more performance out of this ATV than some of the competition’s bigger and heavier models. The soul of this go to tool is its proven fuel injected 500-class engine that delivers plenty of power and fuel efficiency. The strong, refined chassis offers a long suspension stroke for a smooth and nimble ride that’s perfect for rough terrain. The Foreman’s driveline works hard for you by maximizing front-end power transfer and traction. And finally, all of these features are wrapped up in some tough, aggressively styled bodywork and great color choices for 2019. STYLING: Our Foreman models’ bodywork gives these ATVs a tough look. But it does more than just look good: it's designed to last, shrugging off the scrapes and dings of the job or the woods. It also helps protect you from mud and other debris. 35W HEADLIGHTS: Your exploring or work doesn’t have to stop when the sun goes down. Powerful twin headlights offer excellent illumination for the task at hand. LIQUID COOLING: Our time-tested Honda engine is liquid-cooled to provide more consistent operating temperatures and more power than a comparable air-cooled engine. This adds up to better performance and longer engine life. ELECTRONIC DIFFERENTIAL LOCK: When you’re in 4WD mode and you need to get the power to both front wheels, just flip the switch on our electronic differential lock to maximize available traction. The vehicle display will tell you when the diff lock is fully engaged. FUEL INJECTION: By incorporating an oxygen sensor into the system, the Foreman delivers both better fuel efficiency and lower emissions. The ECU instantly adjusts the fuel injection mapping to match riding conditions for maximum fuel efficiency. The result: more time on the trail and more money in your pocket. SEMI-DRY-SUMP ENGINE DESIGN: Compact and light-weight, the Foreman's overhead-valve, semi-dry-sump design creates an engine that's not only shorter from top to bottom, but one that enhances handling by lowering the center of gravity and increasing ground clearance. LONGITUDINAL ENGINE LAYOUT: By orienting the engine crankshaft front to back, we route the flow of power straight to the wheels without any unnecessary right-angle detours, reducing powertrain friction and putting more grunt to the ground. SWINGARM SUSPENSION: The Foreman’s 4x4 rear swingarm with its solid axle provides superior capability for towing and hauling. Its long suspension stroke and plush seat let you tackle your favorite trail or the toughest chores in comfort all day long. SUPERIOR CARRIER CAPACITY: With strong, steel carriers front and rear, and with both offering increased capacity than earlier models, the Foreman is ready to carry what you need. COMFORTABLE SEAT: A plush seat and open rider triangle (bars/seat/pegs) teams up with the suspension to really treat you right. Superior ergonomics have always been a Honda priority, and the Foreman is no exception. With thick, soft foam, it’s supremely comfortable. EASY SERVICE ACCESS: The Foreman’s body styling is not only aggressive, it’s functional. It features a tank and side covers that come off in one piece and without using any tools. That means quick and easy access to the engine. POWERFUL ACG OUTPUT: An alternator offering extra output means the Foreman is capable of handling more of your accessory power needs. INDEPENDENT ASSIST LIGHT: The 45-watt assist light runs independently of the headlights so you can turn it on when you need it, and turn it off when you don’t. TRAXLOK®: Our rock-solid TraxLok system lets you select either 2WD or 4WD, giving you the freedom to choose between lighter steering (in 2WD) and maximizing available traction (in 4WD) when you need it most. DIGITAL METER: In addition to the basics, the Foreman’s instrument panel offers extra information: a clock, water temperature gauge, our “maintenance minder” system and indicator for the electronic differential lock. EASY-TO-USE REVERSE LEVER: Need to get out of a tight spot? The Foreman sports a special reverse lever mechanism that’s designed to be simple to use. Its intuitive design makes it quick and easy to operate. ELECTRIC POWER STEERING: Both speed- and torque-sensitive, Honda's Electric Power Steering (EPS) excels at reducing steering effort and kickback through the handlebar. It's a big help when riding in ruts, over rocks or on long side hills. A specially engineered mounting system for the EPS unit increases strength and rigidity. ELECTRIC SHIFT PROGRAM (ESP): Upshifting and downshifting has never been this easy: With Honda's optional ESP system, you get the ease of an automatic with the strength of a conventional transmission. To shift up or down all you have to do is push one of two handlebar-mounted buttons. Since there's no foot-shift lever, ESP is also a bonus when riding in heavy or mud/snow-covered boots. MSRP excludes destination charge. Visit powersports.honda.com to view applicable destination charge amount. UTILITY ATVs ARE RECOMMENDED ONLY FOR RIDERS 16 YEARS OF AGE AND OLDER. ATVs CAN BE HAZARDOUS TO OPERATE. FOR YOUR SAFETY BE RESPONSIBLE. READ THE OWNER'S MANUAL. ALWAYS WEAR A HELMET, EYE PROTECTION AND PROTECTIVE CLOTHING. BE CAREFUL ON DIFFICULT TERRAIN. ALL ATV RIDERS SHOUD TAKE A TRAINING COURSE. (FREE FOR NEW BUYERS. ASK YOUR DEALER OR CALL ASI AT 800-887-2887). NEVER RIDE UNDER THE INFLUENCE OF DRUGS OR ALCOHOL, ON PAVED SURFACES, ON PUBLIC ROADS, WITH PASSENGERS, OR AT EXCESS SPEEDS. NO STUNT RIDING. RESPECT THE ENVIRONMENT WHEN RIDING. FourTrax and Foreman are registered trademarks of Honda Motor Co., Ltd.